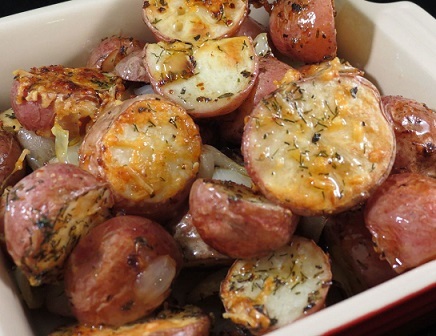 Use this Restaurant Roasted Red Potato Recipe with Herb Grilled Salmon, Pepper Steak, London Broil, Baked Chicken or Chicken Kiev. Actually, these potatoes are great with many meals. A lot of people (including my husband) like these at breakfast. No wonder I started a restaurant 31 years ago! These potatoes will be enjoyed by all. If you have access to fresh herbs, please use them. Preparation time: 15 minutes. Serves: 8-12. For another fabulous restaurant recipe for a starch option click on Garlic Mashed Potatoes. Thanks for visiting! 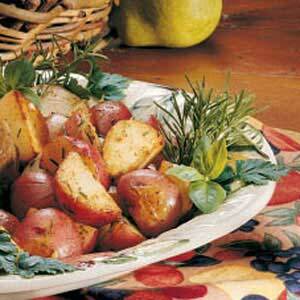 Enjoy your Red Potato Recipe and the company of those you share it with! Come back often!